The Carbon Tax Center voiced strong support this morning for a proposal by the Climate Leadership Council to enact a comprehensive nationwide carbon tax starting at $40 per ton of carbon dioxide and rising over time. The Council is scheduled to release its proposal, “The Conservative Case for Carbon Dividends,” at the National Press Club this morning, Wednesday, Feb. 8, at 9:30 a.m. Modeling by the Carbon Tax Center suggests that a $40/ton carbon tax starting in 2018 and rising by $5/ton each year would, by 2030, reduce U.S. emissions by 2.3 billion metric tons from 2005 level. A $40 per ton tax on carbon pollution starting in 2018 and rising thereafter by $5 per ton each year would, by 2030, reduce annual U.S. CO2 emissions from levels in 2005 (a common baseline year) by an estimated 2.3 billion metric tons, a 40 percent reduction. Alternatively, measured against a moving “business as usual” trajectory with no national carbon price, the 2030 reductions would be 1.4 billion metric tons a year, or nearly 30 percent of unpriced emissions projected for that year. “The robust carbon tax proposed by the Climate Leadership Council would vault the U.S. from the middle to the head of the global pack in reducing heat-trapping, climate-damaging emissions,” said Carbon Tax Center director Charles Komanoff. “It would also provide a template for other nations to follow, creating a real possibility of keeping the rise in global temperatures to 2 degrees Centigrade or less,” Komanoff said. CTC further endorsed the Council’s proposal to “dividend” the carbon tax revenues to U.S. households on a quarterly basis. “We’ve studied ‘fee-and-dividend’ for years, and can vouch that it’s the most equitable, least bureaucratic and least corruptible way to distribute the hundreds of billions of dollars of revenue from a carbon tax, while also generating jobs,” Komanoff said. About CTC: Since 2007, the Carbon Tax Center has stood at the front lines of the struggle for a sustainable climate and a habitable Earth. Our mission: to generate support to enact a transparent and equitable U.S. carbon pollution tax as quickly as possible — one that rises briskly enough to catalyze virtual elimination of U.S. fossil fuel use within several decades and provides a template and impetus for other nations to follow suit. No CARBON TAX please! We have enough taxes already. 97% of the USA population does not need any new taxes. Look up what is going on with Canada’s Hydro One rates for electricity. Electric bills at $500 to $1,000 per month., people deciding how they are going to eat or pay the Hydro bills. Here a great suggestion, all of the pople that want to pay a carbon tax move to Canada and leave the rest of us alone. Mr Bathgate: Please read the full Carbon Tax proposals. 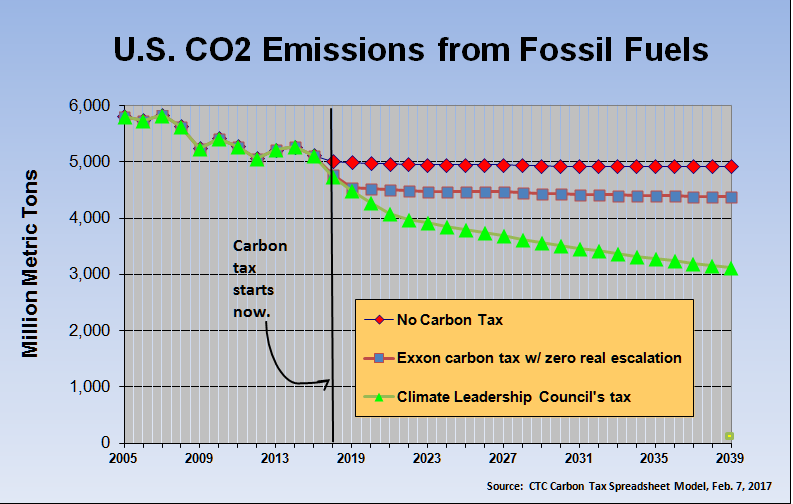 Both the Climate Leadership Council and the Carbon Tax Center propose a tax which is sent back to the people, divvied up on a count-the-noses basis. A clear majority of the people would come out ahead. What we learned from studying Washington State’s carbon tax initiative is this: Tax = policy death. What if we called it the national energy dividend, or the people’s climate dividend, or the USA carbon dividend? Aren’t there some marketing people who can sell this idea by emphasizing the elements that are attractive to people? And I’m not disregarding the issues others raise with fair redistribution of dividends, the fact that dividends come long after the tax was paid, compliance costs, the economic reorganization of jobs and capital, etc. There is no single perfect solution, but there are many possible negotiated solutions. None of these disagreements needs to kill this proposal. The costs of climate change are delayed, but they are huge, and we must always keep our eye on those when contemplating the options before us today. My main objection to this tax is not the tax but how the revenue will be used. For example, there is no effort to do away with federal fuel taxes, nor are any of the funds earmarked for the kinds of infrastructure development necessary to support the fundamental changes in how we obtain and distribute electricity. For example, how is the country going to pay for rapid and disruptive changes in power generation and a smarter grid, to say nothing of the occupational changes required? Moreover, I am very doubtful of the equity of the tax rebates. Yes, everyone will get an equal share of the tax rebate, in theory, but will the rebates improve the profound inequality of both income and wealth in the country. If this is the only way to obtain a carbon tax, fine. However, I have profound reservations about how the revenue will be used, particularly the failure to address the changes in energy infrastructure needed to move toward a substantially more carbon-free energy system, as well as its failure to address the social disruptions that will result from the overall plan. I applaud your willingness to swallow certain points if necessary to obtain a carbon tax. We need more of that open-mindedness. You’ll be happy to hear that the proposal is very much income-progressive. To learn more on that score, please follow the link in the post to “fee and dividend” (second to last paragraph). Finally, there’s a compelling reason to push for that revenue arrangement: it’s probably our best hope in developing political support to keep increasing the carbon tax rate each year. And it’s the steadily rising tax that will create the political wherewithal for the infrastructure investment you rightly support. The Climate Leadership Council proposes only a 2 percent increase per year, which will fall far short of the $5 per year increment in your illustration. So shouldn’t we be cautious about endorsing the tradeoff with regulations, until we get a more robust level of increase? unrelenting loss of biodiversity to realize that there is no time to wait around for that perfect Utopia. Unless these trends are quickly reversed, the social and economic chaos from climate change will render all our efforts AND money useless. Social justice will be thrown on the garbage dump as humanity scrambles to build “defenses” against climate change for their settlements and infrastructure. There won’t be time for social justice much less a movement for it. This is why movements for social justice are actually complicit with corporations and polluters: they are just fending off reality in order to promote short-term solutions that conform to their ideology. I said and wrote this for over forty years. And nothing has changed.